Camping Bonanza 1 är en camping i Blankenberge, Västflandern. Campingen har platser utan skugga och platser med lite skugga. På campingen finns en lekplats. Denna inspektör gör varje år ett besök på Camping Bonanza 1 och inspekterar campingen för ca 200 faciliteter och för andra förekommande punkter. Inspektören är en medarbetare från ACSI och arbetar inte för campingen. The campsite is ideally situated next to an extensive range of cycleways that enables easy access to the town,beach,railway station and supermarkets. The reception staff speak good English and are friendly and helpful with a wide range of experience of the local area. The toilet and shower block is kept immaculate and cleaned several times daily. Showers are controlled by tokens that are free to ACSI customers. We will definitely use this site again. We felt that given the time of year it was still a little bit expensive with no shop on site and no restaurant on site open. The staff were very helpful on arrival, the pitches were flat and the grass short. The site was clean and quiet but there was a charge for showers, hot water for washing clothes and pots and Wifi. There was no paper or soap in the toilets but they were very clean. Our second visit to this site,excellent staff and very good facilities for the cost.We stayed for 6 nights and used the train station in Blankenberge (20 mins walk away) to visit Bruges,Brussels,Ghent and Antwerp.Very efficient service,we paid 76 euros for a 10 journey ticket which saved over 140 euros had we had bought the tickets individually. A great site for visiting Blankenberge - 15 min walk through a lovely private housing area - houses to die for! Pitches for touring Motorhomes very good indeed with own electricity supply (10amps) and drinking water. The toilet/washing facilities are as good as you could hope to find anywhere-immaculate. (Take your own toilet paper). Showers and hot water charged for but not excessive or a problem. Grey water emptying point excellent. Very friendly (excellent English) staff who were very eager to help if needed. If you want to visit Blankenberge, then this is a first class choice. Beach at the resort is excellent but Blankenberge sea-front skyline has been ruined by end-on high rise apartments/hotels - what a shame! Vill du boka campingen Camping Bonanza 1 eller få mera information? Det går bra med nedanstående uppgifter eller via campingens webbsida. 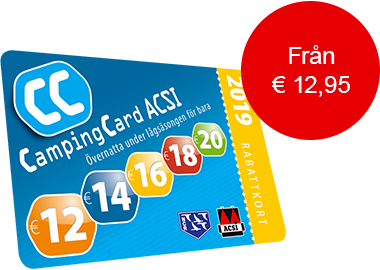 ACSI Eurocampings skickar din informationsförfrågan till "Camping Bonanza 1".